Everyone knows that the first impression is the most important. When customers come to your place of business, your landscaping is their first impression. A well-maintained landscape says a lot about your business; it says you think about the details, you care about your appearance, and you take pride in every aspect of your company. Blooms Landcare provides exceptional commercial landscape maintenance for businesses all around Fort Worth. From your grass to your garden, we can make everything look green, trimmed, and groomed. Call our office today to schedule your commercial landscape maintenance service with our professionals. Spring – During the spring, use fertilizer once the snow has melted. Try to repair any dead patches of lawn, remove any winter protection, and plant cool-season flowers. Summer – During summer, mow regularly, weed as needed, and trim the hedges surrounding your lawn. Next, mulch garden beds and prune fruit-bearing shrubs. Fall – Fall lawn care is simple. Over-seed spots that require refreshing, use grass fertilizer, and rake fallen leaves as needed. Then, plant oak, holly, or beautyberry. Winter – During winter, if rain or snow is lacking, water evergreens. Also, order seeds for spring, fertilize flowers in mild conditions and repair broken arbors. A properly maintained landscape will make a significant difference when attracting new clients or tenants. Hiring the right company will also add value to your property. Before you sign a contract, however, educate yourself. It may even seem slightly overwhelming. First and foremost, get to know your landscape company. If you both better understand each other, your landscape will blossom. Next, set a realistic budget. Each property has unique needs that are dependent on its profile, the size, and special conditions. Take these factors into consideration. Lastly, plan for the long-term. The average life cycle of most plants and trees is ten years, factoring into any disease or storm damage. You’ll want to work directly with your chosen landscaping company to schedule replacements as needed, and factor in this time frame. And please, do not be afraid to ask questions of your landscape crew. At Blooms Landcare, we’re knowledgeable and committed. We’re more than willing to answer your questions! There are some commercial industries that rely on their landscape in order to run their businesses, including golf courses, outdoor event venues, and commercial gardens. However, any business can benefit from a well-maintained landscape. Blooms Landcare has extensive experience in commercial landscape maintenance for a large variety of clients in a wide range of industries. We are happy to assist all private and public clients with professional commercial landscape maintenance and design. When you are shopping around for professional landscape maintenance, you may have a hard time assessing the cost. That is because the cost can vary considerably depending on the needs of the property. If you have a small outdoor landscaping area around your business, the cost of maintenance will obviously be minimal. However, if your business’ livelihood depends upon the maintenance of the property grounds, such as with a golf course, then your costs will be greater. To get the most accurate estimate of monthly maintenance cost, talk to an expert at Blooms Landcare. We are happy to assist you in finding a maintenance plan that fits your budget and keeps your landscape looking great. When is the best time of year for commercial landscape maintenance? The best time of year for commercial landscape maintenance depends on the area in which you live. If you live in a climate like Fort Worth, commercial landscape maintenance should be year-round. In the spring and summer, maintenance can include mowing, pruning, and ensuring your plants are getting the right amount of water and nutrients. During the fall and winter, maintenance would involve clearing your landscaping of debris and fallen leaves, as well as protecting plants when the temperature drops. This type of closely monitored maintenance can be incredibly stressful for a business owner already dealing with the day-to-day running of the company. Let Blooms Landcare take that stress off and handle all your commercial landscape maintenance needs. What is the process to maintain a commercial landscape? Do you have questions about preserving and maintaining your commercial landscape? Contact Blooms Landcare today at 817-688-5352 to hear more about our services. We’re happy to help! 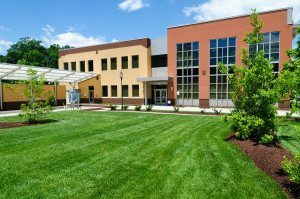 Why is quality commercial landscaping important to property values? Any potential buyers or professional tenants will be attracted to a property with a well-kept landscape. More customers and clients will frequent businesses that maintain their landscaping. The surrounding community places a higher value on commercial properties with beautiful outdoor spaces. All this contributes to a higher value on the real estate market! If you have questions about the link between property values and commercial landscaping, contact Blooms Landcare today! We can be reached at 817-688-5352. What should I consider when hiring a commercial landscaper? Do you have questions about what to know before hiring a commercial landscaper? Contact Blooms Landcare today at 817-688-5352. Our team of landscape experts is always happy to offer their assistance! For more information and pricing regarding our commercial landscape maintenance, contact Blooms Landcare today. Call (817) 688-5352 to schedule your professional landscape services!